I have some code that converts infrared images of Mars into thermal inertia maps, which are then stored as 2D numpy arrays. I've been saving these maps as hdf5 files but I'd really like to save them as raster images so that I can process them in QGIS. I've gone through multiple searches to find how to do this but with no luck. I've tried following the instructions in the tutorial at http://www.gis.usu.edu/~chrisg/python/ but the files I produce using his example code open as plain grey boxes when I import them to QGIS. I feel like if someone could suggest the simplest possible procedure to a simplified example of what I'd like to do then I might be able to make some progress. I have QGIS and GDAL, I'd be very happy to install other frameworks that anyone could recommend. I use Mac OS 10.7. Which procedure would people recommend to convert this data into a raster file that I can open in QGIS? One possible solution to your problem: Convert it into a ASCII Raster, documention for which is here. This should be fairly easy to do with python. Addendum: While you can add it to QGIS as noted, if you try and go into the properties for it (to stylise it), QGIS 1.8.0 hangs. I'm about to report that as a bug. If this happens to you too, then there are plenty of other free GIS's out there. Below is an example that I wrote for a workshop that utilizes the numpy and gdal Python modules. It reads data from one .tif file into a numpy array, does a reclass of the values in the array and then writes it back out to a .tif. From your explanation, it sounds like you might have succeeded in writing out a valid file, but you just need to symbolize it in QGIS. If I remember correctly, when you first add a raster, it often shows up all one color if you don't have a pre-existing color map. I've finally hit upon this solution, which I gained from this discussion (http://osgeo-org.1560.n6.nabble.com/gdal-dev-numpy-array-to-raster-td4354924.html). 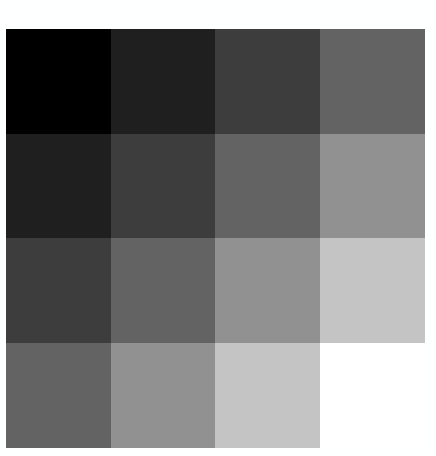 I like it because I can go straight from a numpy array to a tif raster file. I'd be very grateful for comments that could improve on the solution. I'll post it here in case anyone else searches for a similar answer. # For each pixel I know it's latitude and longitude. # one corner, and the resolution of the file. # I don't know why rotation is in twice??? srs.ImportFromEPSG(4326)                     # This one specifies WGS84 lat long. There is also a nice solution in the official GDAL/OGR Cookbook for Python. Not the answer you're looking for? Browse other questions tagged python raster gdal numpy or ask your own question. How to fully load a raster into a numpy array? True color combination using Resourcesat-1? LiDAR point cloud to numpy array to raster?